Food scientists at the National University of Singapore (NUS) have formulated a fast and highly sensitive screening method that can detect minute quantities of pyrethroids in vegetables, a general type of synthetic pesticide used on crops. The innovative approach makes use of magnetic nanoparticles to streamline pyrethorid extraction, decreasing the screening process to below two hours. Synthetic pesticides such as pyrethorids are extensively used in vegetable farming to control agricultural pests. While the use of these pesticides enhances crop yield, long-term ingestion of excessive pesticide residues through the consumption of vegetables and fruits that have been subject to pesticide abuse could result in adverse health effects. Several techniques have since been developed to monitor vegetable crops for pyrethorid residue. However, they require time consuming and expensive procedures such as column filtration and centrifugation and can take nearly six hours to process and analyze a sample. 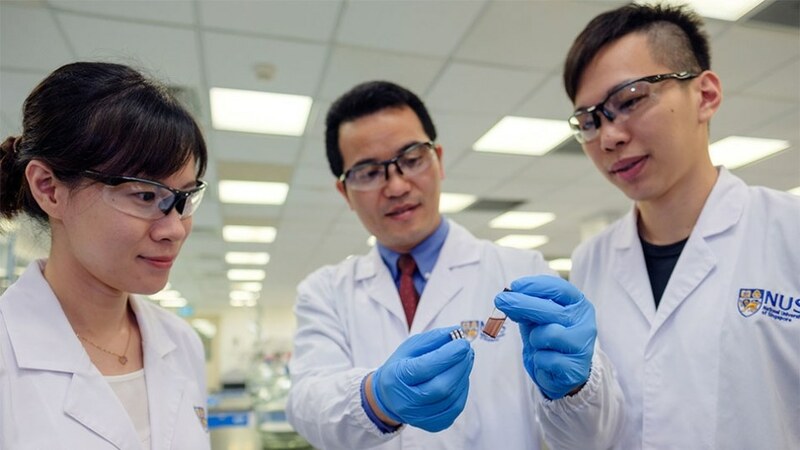 To streamline the procedures, Assistant Professor Yang Hongshun and his Ph.D. student, Miss Yu Xi, both from the Food Science and Technology Programme at the NUS Faculty of Science, created polystyrene-coated magnetic nanoparticles which can effectively extract pyrethorid residue from vegetable crops for examination via simple magnetic separation. The nanoparticles are initially incorporated into a liquid sample gotten from vegetables, serving as “micro magnets” to attract pyrethroid molecules. Pyrethroids bound on the nanoparticles are then washed off by a small amount of organic solvent and gathered for analysis. This innovation can detect pyrethroids at a concentration level of as low as 0.02 nanogram per gram of vegetables and allows analysis to be finished within two hours. Furthermore, the nanoparticles can also be reused up to 30 times, making this screening method both time and cost efficient. This novel screening method can also be adapted for different purposes and holds huge potential for the safety of the food sector. “With small modifications to the extraction process, this method can be used to detect pyrethroids in other food products such as nuts, fruits, and vegetable oils. Modifications can also be made to the coating of the nanoparticles to detect other types of pesticides and chemicals including mycotoxins and antibiotics,” said Miss Yu. In the days ahead, the researchers will explore expanding the applications of their novel method to enable screening of different chemical risks in many food types.